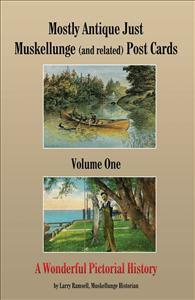 This book is a wonderful and colorful pictorial history of the great sport of Muskie fishing. This book is a wonderful and colorful pictorial history of the great sport of Muskie fishing. There are over 700 muskellunge and muskellunge related post cards covering nearly a century and a quarter of muskellunge history contained herein. Post cards were used as a primary advertising medium for a good part of the 20th century for resorts and towns and they show the importance of this magnificent game fish to early economies. This book will be more of an enjoyable "look" than a "read". Enjoy! !